Seat of Richard Arkwright Esq. 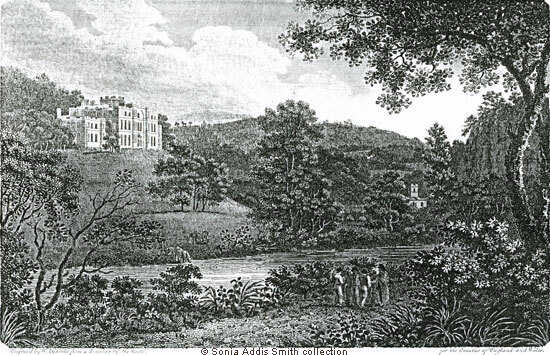 Early engraving of Willersley Castle from the banks of the River Derwent, published less than twenty years after the property was built. Note the view of St. Mary's Chapel on the right. Neither the castle nor the chapel were completed before Sir Richard Arkwright's death in 1892. The castle had suffered fire damage shortly before he was supposed to move in whilst the chapel did not open for divine service until 1797. Engraving from 'The Beauties of England and Wales', by John Britton and Edward Wedlake Brayley, Vol III, published in 1802, Cumberland, Isle of Man, and Derbyshire. Reproduced here with the very kind permission and help of Sonia Addis Smith. Davies, David Peter (1811) "History of Derbyshire" pub. S. Mason, Belper. Derbyshire's Parishes, 1811 is based on this book. See Cromford under Parishes C - D.